Extreme is the word that comes immediately to mind when I look at Esoteric's product lineup and especially when I dig into any of the products themselves. Where other companies end in the product-development cycle -- with circuit boards, transformers and other components housed in steel chassis with aluminum faceplates -- Esoteric begins, re-engineering every circuit and assembly to the last degree -- to the extreme. For its digital players, Esoteric is not satisfied to use just any off-the-shelf mechanism, or even the very best OEM equivalent. No, Esoteric developed the VRDS transport mechanism and then has refined it over 20 years to create the VRDS-NEO, which retains the goal of clamping the digital disc for maximum data-reading integrity. The VRDS-NEO is built to standards appropriate for critical medical use, not simply spinning and reading the data from a CD. Digital-to-analog conversion stages are often dual-mono circuits that are fully balanced, using multiple DACs per channel to effect a greater sonic outcome. Transformers are overbuilt and proprietary, and chassis are machined to the tightest tolerances and packed with everything needed to make an Esoteric product what it is. 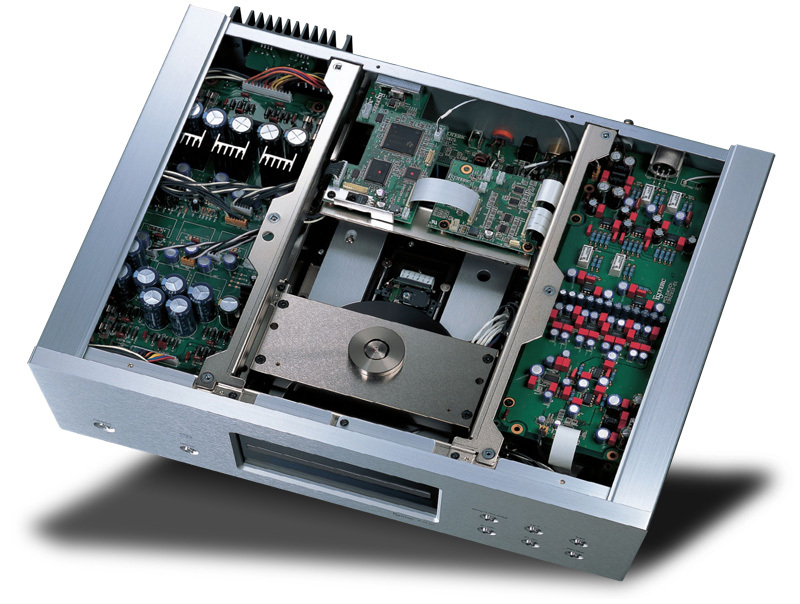 I have reviewed a number of Esoteric digital products over the past half-dozen years, and arguably the most impressive have been the X-01 and X-01 Limited CD/SACD players, which incorporated many of the design elements of the company's expensive digital separates into a single unit. The X-01 appeared in 2004, with the Limited upgrade following two years later. The core of the two players was identical: the VRDS-NEO transport mechanism and Burr-Brown PCM1704 DACs in a four-chip-per-channel configuration. Differences in wiring, internal parts and input/output jacks necessitated the upgrade and made a sonic difference as well. The latest version in the X-01 series, the X-01 D2 ($16,500), isn't so much a product of refinement as a wholesale change in thinking. The VRDS-NEO transport and Burr-Brown DACs remain at the heart of the X-01 D2, but the inclusion of a pair of Analog Devices AD1955 DACs signals a major difference in the X-01 D2's architecture. Whereas the X-01 and X-01 Limited converted SACD's DSD datastream to 88.2kHz PCM digital before turning it into an analog signal, the X-01 D2 handles DSD in its native format. In fact, like the P-03/D-03 transport/DAC combination, the X-01 D2 can convert PCM digital to DSD, signaling that this all-in-one player is in many ways a one-box version of Esoteric's penultimate separates -- all for considerably less money. Like its predecessors, the X-01 D2 is fully balanced and employs a mono digital-to-analog output board per channel. The VRDS-NEO mechanism features -- among many other things -- a coreless motor, ceramic ball bearings and a duralumin supporting table for the disc. Also retained is the Word Sync input, which allows users to slave the player to one of Esoteric's separate word clocks for greater audio precision. All of this indicates a no-compromise approach, at least in terms of producing a single-box digital player. Missing, perhaps conspicuously these days, is a USB input, which would allow the X-01 D2 to act as a digital-to-analog converter for a computer-based audio system. I wouldn't be surprised if Esoteric has this in the works. However, given the attention paid with the X-01 D2 to the extraction of the data from the digital disc, this would seem more like a concession to convenience and convergence than a sonic necessity. Physically, the X-01 D2 is identical to its predecessors, measuring 17 1/2"W x 6"H x 14"D and weighing 55 pounds. It feels like a solid mass, so compact and heavy is its chassis. It is available only in silver finish, whose fine grain increases its attractiveness. It has been a while since I heard either the X-01 or X-01 Limited, but I did use the P-03/D-03 combination for a number of months after my review three years ago. Although there was no overlap between the separates and the X-01 D2 in my system, there was certainly a great deal of sonic similarity, so much, in fact, that without listening to the two side by side, I'm not sure I could tell them apart. What sets Esoteric digital gear apart from its competition is the level of detail it unearths while presenting the music in a dense, compelling way. There is instrumental weight and low-end heft, and they are woven into a fully resolved, deeply involving presentation. All of the technology packed into the X-01 D2 leads to a pleasing musical outcome. Perhaps the main reason I listen to so much classic jazz is that contemporary jazz, or merely instrumental music, lacks the fire of innovation and urgency that were part and parcel of so many musicians' point of view in the 1950s and 1960s. But there are labels whose mission is to publish the innovative, urgent music of today, and chief among these is ECM, an old-timer in the music business, having a catalog of more than 1000 recordings that reach back to the late 1960s. While I find ECM releases as a whole to be of inconsistent musical interest to me, some of them are absolutely vital, including a pair of hard-to-categorize recordings from a group called Nik B�rtsch's Ronin. Is it jazz or pop or world music? It's really all of these, though B�rtsch's term, "zen funk," describes it best. Labels aside, it's music that epitomizes cool, melodically and intellectually, and it provides a workout for any system on which it is played, much of this coming from the diverse instrumentation (piano, clarinet or sax, bass, drums, and other percussion) and ECM's trademark spacious, tranquil recording work. The rhythmic and dynamic life the X-01 D2 brings to NBR's Holon CD (ECM 2049) is vital to appreciating the unique music fully. The bottom-end weight and drive propel the parts of each number -- titled "Moduls" in the liner notes -- dominated by percussion, while the player's high resolution captures space with seeming ease. With CDs that are less challenging rhythmically and dynamically, like Josh Ritter's great The Animal Years (V2 27296), the X-01 D2 conveys the recording's space along with the music's delicacy. Quirky spatial effects, like the whirring that floats across the soundstage near the beginning of "Best for the Best," are differentiated from what is a complex and profuse mix of instruments, giving the song a sense of sonic entropy that enhances its sprawling, Dylanesque lyrics. Needless to say, if it's on your digital recordings, you'll hear it with the X-01 D2, including how your CDs and SACDs sound in relation to each other. What SACD does especially well -- communicate the uniqueness of each recording tonally and spatially -- the X-01 D2 communicates with ease, but what I didn't expect is how this player makes the difference between the two formats all the more obvious. Whether playing the CD and SACD layers of hybrid discs -- you can choose with the X-01 D2 -- or different discs of the same music, the X-01 D2 captured the finely drawn treble and distinct spatial characteristics that are the defining marks of SACD. What the X-01 D2 does clearly better than the original unit, and improves on the Limited's performance as well, is impart the music's flow. This is hard to define -- it's liquidity as opposed to granularity, momentum as opposed to sluggishness -- but easy to hear. It's what analog does so well, and the X-01 D2 does it too. The X-01 D2 is not forgiving of poor recordings, however, or at all euphonic. However, its high level of detail resides within the fabric of the music, not as a counterpoint to it. Some very costly digital gear doesn't do this nearly as well, or even at all. As with all of the Esoteric products I've reviewed, the X-01 D2 achieved its greatest sonic splendor via its balanced outputs. While the single-ended outputs surely reveal the X-01 D2's sonic personality, the music loses some of the flow and weight that make the X-01 D2 what it is. Esoteric has expanded its product lineup to include integrated amps, a preamp, power amps and even a phono stage, but the company's reputation will continue to ride on its multiformat digital players like the X-01 D2. And that's a very good position to be in! Warranty: Three years parts and labor with warranty registration; two years without.